Tremont, a leader in the hedge fund industry, managed approximately $10 billion in hedge fund assets before closing in 2009. Tremont had been using asp technology and web forms to maintain its intranet. It required web specialists to update and manage key dynamic content areas. It was decided in 2006 to migrate into SharePoint. A few years later their SharePoint 2007 farm became spread across three different servers and about 12 different web apps. Tremont had an older portal based on technologies that were outdated. We worked closely with Tremont to discuss features migration and recreated the existing "Trehouse portal" into a feature-rich SharePoint version. This was linked to RSS feeds and stocks reports. As software design became firmed up it was securely accessible for interaction with the Tremont IT staff. 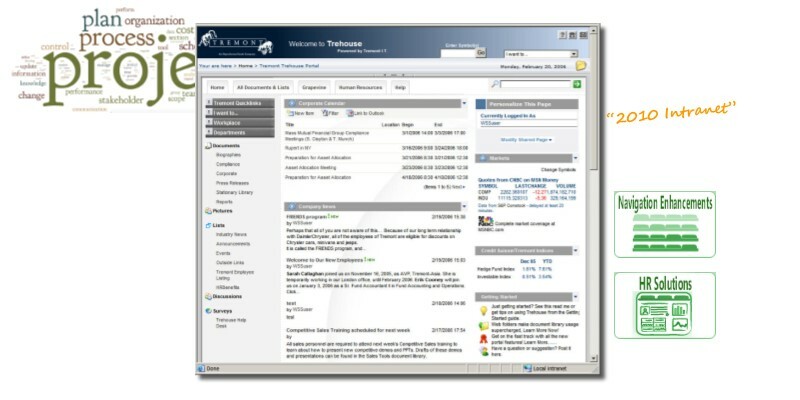 The new Trehouse portal was delivered on a server with SQL reporting services that we also setup. In 2009... A few years had gone by and Tremont had experimented with pushing SharePoint into several areas. They had procured resources from some overseas programming agencies and about a half a dozen portals had been created for aggregating data or process automation. When we were asked back to assist we found these in an undocumented state with a lot of compiled code and it was a bit of a detective project to figure this out and migrate them without causing any business interruption. We successfully reorganized the information architecture and migrated 3 separate farms into one central 2010 farm, which also had advanced security, SSL certificates, and forms-based authentication. With the addition of a multimedia training library, Tremont experienced an easy adoption curve and few changeover issues for their user population. Documentation included with the project contained a range of materials to support rollout, including PowerPoints, “tips” sheets, brochures, and admin training documents. We have been SharePoint consultants since the first version of SharePoint so contact us today! In that time we've developed many SharePoint navigation apps that will make your SharePoint friendlier and easier for your staff to use. We invite you to learn more about our SharePoint Mega Menus and SimpleTabs as well as our on-demand training system InfoPedia.